The Xilinx Zynq-7000 EPP (Extensible Processing Platform) is a new class of device, offering a mix of a dual-core ARM Cortex-A9 subsystem (including cache, memory controllers, interface, and peripheral functions) with a 28-nm programmable digital FPGA and programmable analog capabilities. This combination opens the door to a range of demanding applications, including automotive (video processing and analytics requirements for driver assistance systems), broadcast (high-bit-rate bandwidth for high-accuracy video processing and analytics), and industrial control systems that combine high-processing demands with tight integration requirements. Z-7010 – Artix-7 FPGA with 28K logic cells. Z-7020 – Artix-7 FPGA with 85K logic cells. Z-7030 – Kintex-7 FPGA with 125K logic cells. Z-7045 – Kintex-7 FPGA with 350K logic cells. System architects can optimize and differentiate systems on a cost-efficient, power-optimized platform. 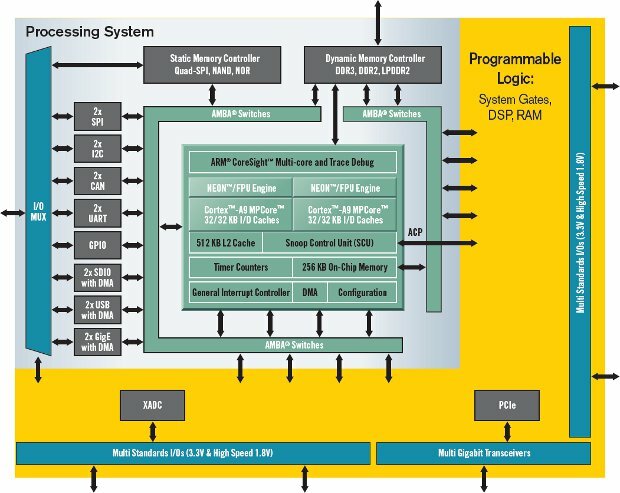 Logic designers have a familiar register transfer-level (RTL) environment (Xilinx ISE Design Suite, Xilinx Embedded Developers Kit (EDK)) to extend capabilities and performance. Software developers can program in a familiar environment (SDK based on Eclipse, open source software, Linux distributions, etc…) to build and debug applications. ARM Cortex-A9 MPCore kernel sources, software drivers, Board Support Package (BSP) for Zynq-7000 EPP boards via Xilinx GIT repository. You can get support via their Wiki and Forums. Commercial Linux distributions (PetaLogix PetaLinux System Development Kit (SDK) and Wind River Linux) and tools (ARM DS 5, Lauterbach TRACE32 PowerTools, Mentor Sourcery CodeBench toolchain, Wind River WorkBench, etc..) are also available. The video below describes and demonstrates the platform with Linux (command line) and busybox running on Zynq-7020 EPP. Xilinx Zynq-7000 EPP ZC702 Evaluation Kit (595 USD) – This kit based on Zynq-7020 includes all the basic components to enable a complete embedded processing platform. Xilinx Zynq-7000 EPP Video Kit (1195 USD) – This kit based on Zynq-7020 includes hardware, software and IP components necessary for the development of custom video applications. Zynq-7000 EPP ZedBoard. This community board appears to be in development and i could not find further information at this time. Beside QEMU, you could also take advantage of Zynq-7000 EPP Extensible Virtual Platform designed with the help of Cadence to emulate Zynq-7000 hardware, but since development hardware is already available, its usefulness may be limited, unless you need to emulate a component not present in the development kits/boards. The Xilinx Zynq-7000 platform recently won an ACE AWARDS ULTIMATE PRODUCTS of 2011 in the SoC category. It is currently available and pricing starts at 15 USD in high volumes. 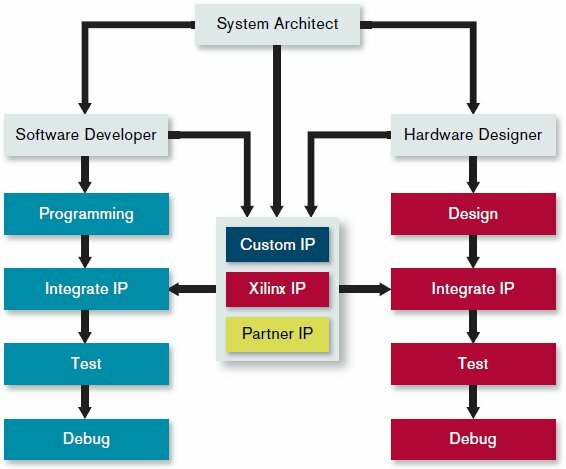 You can get further information on Xilinx Zynq-7000 Platform page.